Has it been almost a month since I’ve blogged? I can’t believe it! I haven’t lost interest, but somehow this school year I haven’t been able to build this into my schedule. I should, because I get a cozy little sense of accomplishment when I look back over my blog pictures, and sometimes when there is kid crap all over the floor and my dog is barking at the mailman and my son is peeing on the floor…well, I just need that sense of accomplishment! So I’m stating for the record that I AM going to blog three times per week until I get caught up on some of these projects I want to record. First off, I’ve been obsessively covering things with scrapbook paper. I don’t “scrapbook” in the sense of sticking photographs on cute paper and adding stickers, but I do love to buy those big, awesome stacks of scrapbook paper they sell in crafts stores. Those pretty 12×12 sheets can be used for anything! 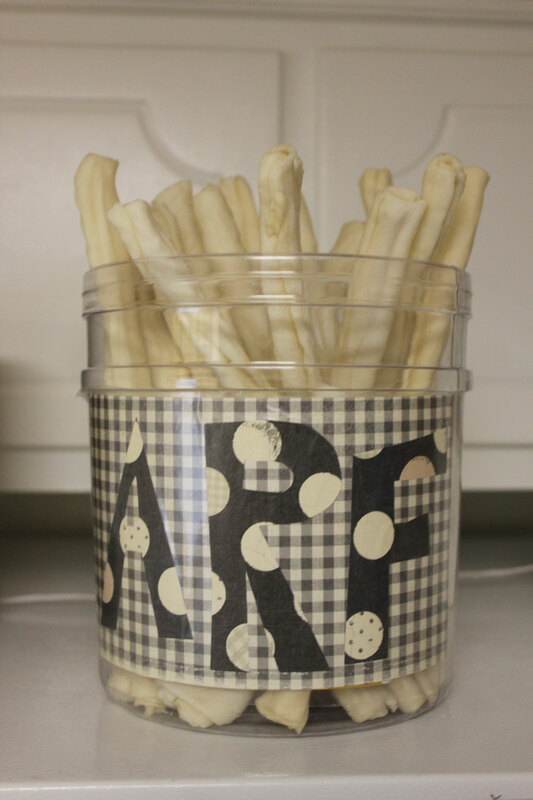 Lately I’ve been recycling containers, such as this pretzel tub I’ve turned into a dog treat jar, by gluing scrapbook paper on them and then covering it with clear contact paper, which protects the paper and allows me to wipe the surface clean. This jar sits on top of my fridge and looks much better than the Target bag that was holding dog treats up there before. This is not a crafty thing but is just a favorite recent photo. 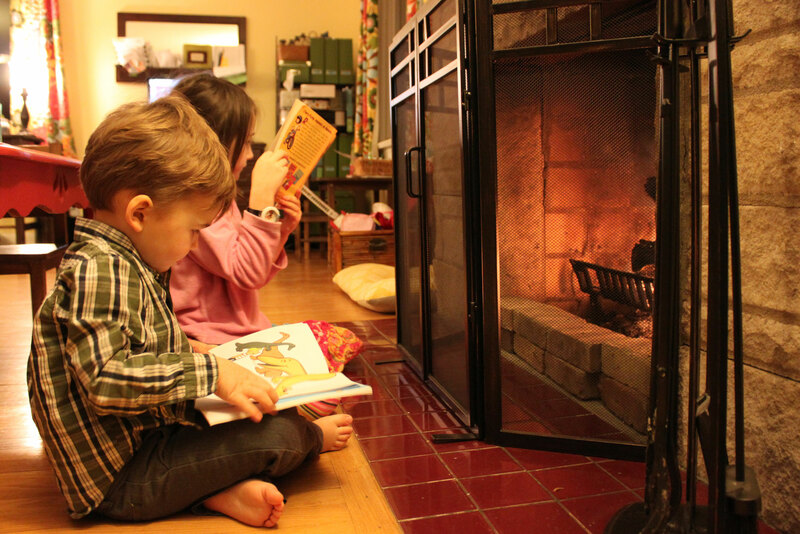 Kentucky is partaking in this Midwest cold snap, and we’ve never been happier homeschoolers than on these frigid mornings when we can roll out of bed and light a fire and read books by it in our pajamas. I snapped this photo a couple evenings ago, when the kids were ending the day basically the same way we started it.